Well, I can’t speak for the rest of the country, but here in the Pacific Northwest, we haven’t had much sun this summer… but there’s a silver lining – I have a feeling we’ll be seeing a lot of green tomatoes! Of course, they are much-loved and celebrated in the South, but with such a short growing season that often results in more green tomatoes than we know what to do with, we should have festivals dedicated to them, too! No matter where you live, though, there are some surefire ways to ripen green tomatoes. For smaller and cherry varieties, you can cut the vine and hang it up in your kitchen window. They’ll ripen slowly (and look pretty!). For bigger tomatoes, one of my favorite tricks is to individually wrap unblemished green tomatoes with their stem still on. Store them in a box in a dark place and check them often for any molders and to see how the ripening is going. Using this method, I have enjoyed fresh garden tomatoes as far along as Thanksgiving! If you’re ready to try your hand at cooking up some of those green tomatoes, they make a wonderful addition to chow chow relish or homemade green tomato mincemeat. You can even pickle the smaller ones for a really fab martini or Bloody Mary garnish! And who can resist them in the most famous preparation – Fried Green Tomatoes! I love serving them fresh out of them pan with a d’lish remoulade dipping sauce – the perfect late summer appetizer or a fun afternoon snack! Preheat an oven to 165° to 200°F. In a plate or shallow bowl, mix the flour, cornmeal, salt, pepper, and paprika with a fork. Dredge the tomato slices, a few at a time, in the seasoned flour to coat well. Set the tomatoes aside on a lightly floured baking sheet. Reserve the flour mixture. In a large skillet, heat 1/4 to 1/3 inch oil over medium heat. Fry the tomato slices in batches for about 2 to 5 minutes, or until golden brown on each side, turning as necessary. As the tomatoes are done, transfer them to a cake rack set on a baking pan to keep warm in the low oven. 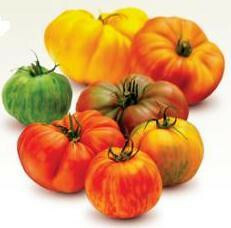 Divide the tomatoes among individual plates and serve immediately, accompanied with the remoulade. I also like to add a touch of horseradish to this for some extra kick! Chef’s Note: The sauce can be made up to 4 days in advance and refrigerated until needed. Recipe from Kathy Casey’s Northwest Table, Chronicle Books, San Francisco. Copyright © 2006 by Kathy Casey. August is Washington Wine Month, so I thought this would be the perfect time to talk about sangrias! 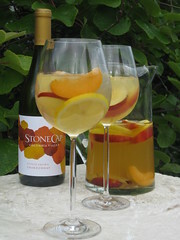 I love wine by the glass, but for a truly refreshing, light sip, a Summertime White Sangria is the way to go. It is perfect for a big bash (it batches up super-easily!) or a casual summer day on the patio. Local, in-season fruit like peaches, plums, apricots and nectarines mingle so nicely with Stonecap Chardonnay, local honey and a touch of liqueur until you’re ready to serve – then just add some ice and voila! Instant party in a pitcher! If red is more your thing, this sangria is also d’lish made with StoneCap Merlot or Cabernet wine. If your garden is growing as crazy as mine is, you’ve probably wondered what to do with all of those herbs! Of course they are essential to your cooking, but they also add a wonderful, herbaliciousness to cocktails and a fresh, dry flavor. If you don’t grow herbs, your local farmers market is the perfect place to get inspired by the bounty of fresh herbs for your next cocktail. Shake up some fresh sage in a margarita for a really fresh, green note that pairs so well with the tequila – try a Sunset Sage Margarita for an evening out on the patio with friends. Rosemary and lemon are good friends and pairing the two easily jazzes up a classic Lemon Drop. Of course, the ever popular mojito and Julep benefit from mint’s bright, refreshing kick and teaming up thyme and honey in a Collins puts a sweet, summery spin on the timeless favorite. For the non-imbiber, stir up a Herbalicious H2O; light, refreshing and crisp! For the Tuscan Rosemary Lemon Drop recipes, stay tuned to my show Kathy Casey’s Liquid Kitchen on Small Screen Network later this summer or check it out in Sips & Apps! Crush the sage leaf and drop into a cocktail shaker. Fill the shaker with ice, then measure in the remaining liquid ingredients. Cap and shake vigorously until very cold. Strain into a chilled cocktail glass and float a fresh sage leaf for garnish. *Simple Syrup: combine 2 cups sugar with 2 cups water in a small sauce pan. Bring to a boil then immediately remove from heat. Cool and store refrigerated. The name says it all! Clean and fresh, this drink has no sugar and is very spa-like with its infusion of botanicals. Tear the 6 mint and 4 cilantro sprigs and drop into a medium container. Add the fruit, ginger, and water and stir. Cover and refrigerate, overnight, to infuse before using. Serve over ice, in large wine glasses with some of the fruit in each serving. Garnish as desired. Water is essential for all the beverages that we drink from flavored sodas to well-balanced cocktails. Make water stand out by infusing fresh ingredients with it then add a bit of a spirit and you’ll have a simple but tasty drink! Check out this article in Class Magazine for a variety H2O cocktail recipes, including my Berry Purity H2O and Pineapple Cilantro H2O cocktails! As the summer continues to heat onward, it’s never to late to enjoy a low-calorie sipper while soaking up some Vitamin D. Check out this blog post in Seattle Magazine for my Pineapple-Cilantro H2O infused-water recipe as well as the tasty hotspot Poppy, serving out herbaceous sippers. Everyone loves a good cocktail, but not everyone drinks. There’s more to a non-alcoholic beverage program than just water or flavor sodas. Check out this article in Nightclub & Bar about how profitable a well executed non-alcoholic beverage program can be. Preserve the Flavor of Summer – Celebrate Can it Forward Day! Canning is a fantastic way to preserve the flavors of the season and an age old custom. Lots of people learned to can from their friends or family – I learned to can from my mom and grandma, making jar upon jar of preserved peaches, apricots and yummy jam… there’s nothing like a PB&J with jam you’ve made yourself! If “putting up” some of summer’s delicious bounty sounds like a fantastic idea to you, there’s no time better than the present to jump right in – head to Pike Place Market on Saturday, August 13th and Sunday, August 14th for National Can It Forward Day! Canning Across America and Jardin America, the makers of Ball home canning products, have teamed up to present two days full of fun, educational canning and cooking demos. But don’t worry if you can’t make it – the entire event will be streaming live at freshpreserving.com from 8:00AM to 4:00PM on Saturday. For the full event schedule, click here! If you just can’t wait to get started canning, check out my easy and delicious recipe for Strawberry Lemon Poppyseed Jam! And don’t forget to visit Canning Across America to join the Canvolution and find mouth-watering recipes, gorgeous photography and a warm, welcoming community of like-minded canning enthusiasts.